The pages were originally longer, but were cut down by a previous collector to fit inside a frame. Unfortunately the birth record of John and Elizabeth’s third child, Catharine, was cut out of the first page. Nothing appears to be missing from the second page. Johannes Hornung (John Horning) (1755-1803) was a son of immigrant Ludwig Hornung (Lewis Horning) and wife Catherine Keyser, a daughter of Peter and Margaret Supplee Keyser of Germantown. Ludwig and Catherine operated a mill near Oaks in Upper Providence Township, and were members of the Skippack Mennonite congregation. Elizabeth Haal (Hall) (1761-1824) was the daughter of Johannes Haal (John Hall) of Lower Providence Township, and his first wife Mary Van Fossen. Mary died in 1777 and was buried at the Skippack Mennonite Cemetery. 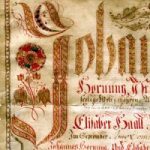 John Hall remarried to Barbara Horning, oldest daughter of Ludwig and Catherine. Elizabeth Hall married John Horning in 1780, after which her father was also her brother-in-law! After Horning’s death in 1803, Elizabeth remarried to widower John Detweiler (1747-1826), a deacon in the “Funkite” Church, whose first wife had been a daughter of bishop Christian Funk. Elizabeth moved from Skippack to live with John at the Funk mill property in Franconia Township, and both she and John Detweiler are likely buried at Delp’s Cemetery, though no readable gravestones survive for them. Elizabeth’s daughter Mary (1790-1879), one of the children in this register, married her step-brother Abraham Detwiler (1790-1832), and they operated Funk’s mill for a time after his father’s death. As the Funkite church died out in the mid-19th century, Mary and others who had been members migrated to churches of various kinds. Mary Detwiler became a member of Trinity Christian Society (now United Church of Christ) at Collegeville, the congregation founded by excommunicated Mennonite preacher Abraham Hunsicker of Skippack. Another daughter, Anna (1793-1865), married Samuel Dierstein of Rockhill and moved to Lapeer County, Michigan. Their descendants use a less common spelling of the name — Dirstine. Son Samuel (1796-1846) also moved to Rockhill. His son Abel G. Horning (1825-1906) later served as a minister at Rockhill Mennonite Church. The MHC holds Abel’s copy of Der Sänger am Grabe [Singer at the Grave], a special hymnbook for graveside services, to which he added a few verses on a rear flyleaf. According to old song leader James Derstine, who knew Abel, this verse was intended to fill an empty spot in the burial liturgy that Horning found awkward — when the lid of a coffin was being screwed down before burial. weil ich nun von euch scheiden muß. because now I must leave you. Sons Henry (1798-1872) and William (1801-1881) joined the Church of the Brethren. Henry is buried at Mingo (Providence) Brethren Cemetery, and William married a daughter of preacher John Price of Coventry. William and Hannah Price Horning farmed the old Funk homestead in Franconia after his stepbrother Abraham Detwiler, for about ten years, until 1840 when they moved west to Montgomery County, Ohio. William was a talented mechanic. Memorandum is to certify that I John Horning have served as Overseer of the poor in the township of Perqueoman and Skippack for the Year 1785 on and for my fathers Estate.